In January 1941 President Roosevelt, shared with congress his vision for a postwar world founded on four fundamental human freedoms: freedom of speech, freedom of worship, freedom from want, and freedom from fear. 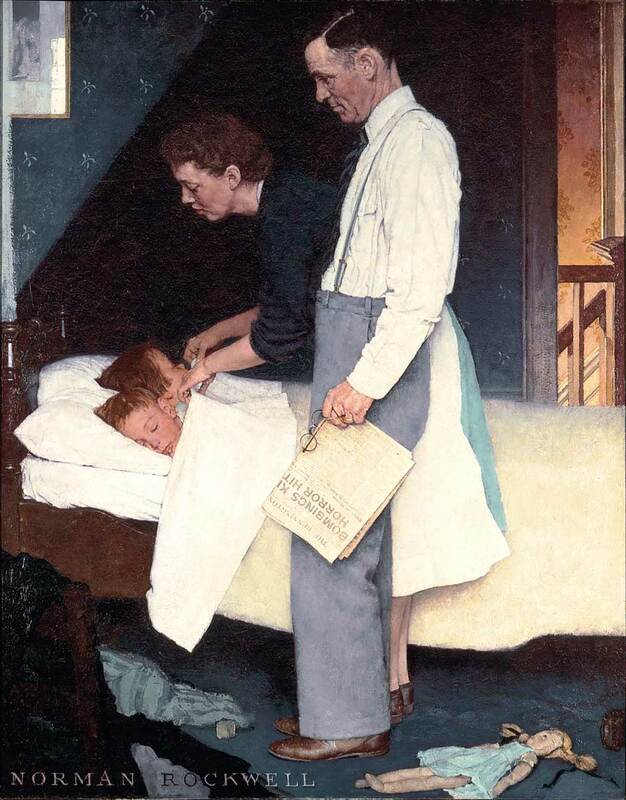 Inspired by his words, Rockwell created “Four Freedoms.” Originally published in the Post the paintings were a huge success and were later used to sell war bonds and stamps. The Four Freedoms paintings were sent on a national tour. They traveled to sixteen cities and were visited by more than a million people who purchased $133 million worth of war bonds and stamps. Printed or digital copies of Rockwell’s “Four Freedoms” paintings. [insert link to images]. What do you notice in this illustration? Why do you think Rockwell chose this scene to illustrate this Freedom? What do you think Rockwell was trying to say in this illustration? Why? Gather as a class and discuss what each of these freedoms may have meant for people during the time in which they were painted. You might have them visit the following sites for more information on the times. Then invite students to reflect upon what each of these freedoms mean to them today. To do this you might have students right an essay, poem or short paragraph on each. Create a gallery that highlights student’s words along Rockwell’s images. Ask students to think about a fifth freedom. Ask, What freedom do you think is missing from Rockwell’s Work. Then have students draw a fifth painting to depict their fifth freedom. If you are studying other parts of the world ask students to think from the perspective of someone who lives in another country or who leads a very different life, For example, what freedom might a Syrian refugee add to this collection? As, students to reflect upon why Rockwell’s images were so successful at selling ward bonds. Ask, What do you think people responded to in Rockwell’s work and why?